I'm reminded of a tale told after a Mess Dinner. The Sergeant Major was approached by a naïve young lady and was asked "Sgt. Major, what do you wear under that kilt? He replied; "Madam, I'm a mon of few words. G'me your hand"
There's a little more the tale, but I don't want to get my knuckles rapped. In our Drill Hall, there is a polished brass plate. Traditionally, on drill nights, everyone has passed over it to reveal whether one is "Regimental" as required. A Challenge in the Mess, if you are found NOT to be "Regimental" means you buy the drinks. bet that gets interesting once the temperature drops a bit. 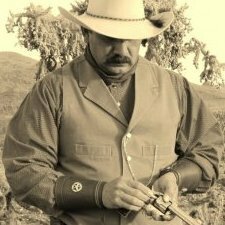 What do real cowboys wear under their kilts? If you wanna wear a kilt you need to go to Dragon Con, in Atlanta. They have the kilt blowing, using an electric leaf blower. This don't really show nothing but the girls in the audience love it. Yup that's pretty much what i look like but you can't tell because you do have to wear a long sleeved shirt. Also, i left the sword in the truck cause it got in the way of the pistols. But if ya HAD to, well... you could always ride sidesaddle~!! That was for the whole kit, kilt, gillie shoes, socks, sporan and belt, shirt, tie, vest, formal coat, dress kidskin gloves, dress cape, sgian dhub, sock flashes, balmoral ca, , even a kilt pin for the Taylor clan, everything but a bottle of Scotch. If you hold the Queen's Commission, it gets a little more involved and an includes an expensive broadsword with a basket hilt. 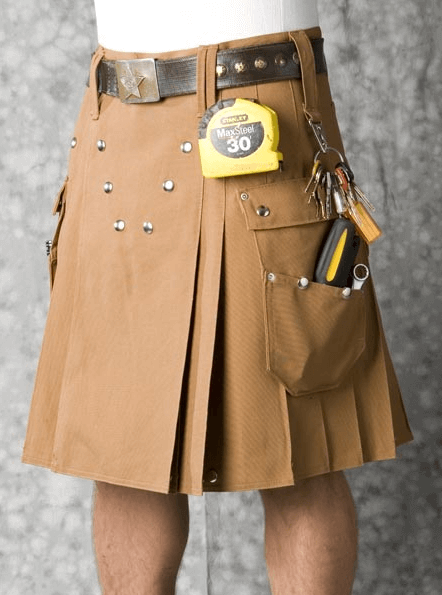 If the price is too steep, you can always use a working man's kilt, and get double duty from it......Thrifty, laddie! Considering that this is grammar optional site, I don’t assume too much by the placement or misplacement of a comma. Are you talking breacan an fheilidh? Or féileadh beag? I was a a Highland Games once and witnessed two women with small mirrors, about 3 X 5, affixed to the top of their shoes atop their toes.....just an observation. The reflection might cause a procedural. I had a guy who didn't believe me when I told him what I was wearing under my breacan an fheilidh, so he checked. He turned a very bright red and sputtered, "First time I've seen THAT looking at me from under a skirt!" I rather enjoyed his embarrassment. I've taken to telling people, "The bottom of my shirt, two socks, two garters, two shoes, and a knife." The reflection might cause a procedural. I think of kilts like I thought of bell bottom pants. When they first showed up, I thought that was about the stupidest looking thing that people wore. I'd see hippie wannabes walking around wearing bell-bottoms and I was wearing straight legged pants. Then, in 11th grade, I needed a new pair of dress pants. Nowhere in this town could straight legged dress pants be found. I had to wear flares, because that is all that was available. When they stop making pants, I will probably start to wear a kilt. Until then I will leave the skirts for the women. Heck... they even have a place in the Boy Scouts Wood Badge program. Then get ready brother! I have my kilt with the sporan, socks, shirt and belt but unfortunately I misunderstood where the belt line of the kilt falls so the kilt goes back for some upward adjustment. The thing that pushed me over the top is my Grandson, Bones Blanchard is marrying in June and we have recently found through DNA testing that we have a huge amount of Irish in our back ground. I promised his wife to be that I would wear a kilt to her wedding. The Irish kilts are worn with patterns that identify a county rather than a clan and are much more subdued in color. Mine is in the "All Ireland" pattern because of the difficulty in locating specfic areas when my folk came from all over Ireland, were forced to the south and then migrated to Virginia then Missouri. Me either. But, I have read some obituaries with a big grin. With a commie belt buckle?? Must be clan MacMarx. Problem with me is that my legs are so short a kilt would look like a full-length skirt. Have it hemmed... or just get a mini to start with. ya think . I ortta fire up the 379 , and find a load of hooch ?